Re: Fire heading towards the hot springs! Good website Laughing Bear :-) I called the number there for Pinnacle Fire info ( 909-383-5688 ) and the woman confirmed what you had posted, DCHS is closed. She also told me of another website which has excellent more indepth info on specific fires. At that site just click on Pinnacle Fire and another page will come up with lots of additional up to date info on this fire, like for example this was listed: " Hwy 173 remains closed. Containment lines are currently holding. OHV enthusiasts are encouraged to not enter the fire area. The Pinncales OHV staging area is closed. Forest roads 2N25, 2N75, 2N38, 3N34, 3N59A and 2N33 @ 2N34 are closed. 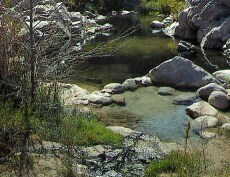 The PCT is closed in the lower Deep Creek area between the Mojave River Forks Dam and Splinters Cabin ". Fire heading towards the hot springs!